Publishers depend on agents to sort through the possibilities to discover new talent, develop proposals to a professional level, and handhold and cajole the author through the lengthy process of actually delivering the manuscript a contract calls for. Agents live in a world where the big publishers are really the only source of substantial revenue. So they have lunch a lot to discuss what amount to joint efforts. I don’t know if it is unique to publishing, but our industry’s convention that the buyer (the publishing editor) pays for the seller’s (the agent’s) lunch must be very unusual. By constantly monitoring what the editors are looking for and are inclined to buy and each house’s current frame of mind of what will work and what won’t, agents get the information that, in turn, directs them to what will sell. What will “sell”, to an agent, means what people who are personally known will want to buy. It doesn’t require the agent to think in terms of what the public will buy; that’s the publisher’s job. The agent’s job is to deliver what the publishers have decided is commercially viable. There is, in general, a great deal of mutual respect here. Obviously, there is a point where the partnership becomes adversarial: publishers want to pay as little as they can for books and agents want to get as much as they can. But, in general, these competing interests are resolved in ways consistent with the need both sides have to continue working together in the future. There are only six very large houses and only a small handful of others that can occasionally play at that level. And while the agent community is somewhat less consolidated (you can be a very successful agent with only one or two big clients; you can’t be a very successful big publisher with only one or two big authors), both sides do each deal knowing there will be a next deal they’ll want to do with each other coming along soon. This symbiosis is important to remember when we consider that one of the big publishers’ defenses against disintermediation is their ability to curate, to filter. There is a school of thought (which is an attractive one to publishers thinking about their role in the increasingly digital world of books) that when content choices become more plentiful, reliable branded filters become more valuable. All sides recognize that the principal brand value lies with the author. I am increasingly coming to the view that the big publisher name — Random House or Simon & Schuster — also communicates “value” to the consumer, although it doesn’t describe the potential reading experience with anything like the specificity that the author name does. The agent name, of course, means nothing at all to the public. So the publisher is essentially getting credit for a filtering process for which they are the last step after agents have done a lot of weeding out before them. 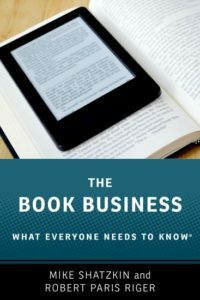 Two years ago, when we were organizing the first Digital Book World conference, we foresaw that ebooks would lead to much cheaper and more accessible self-publishing opportunities that some authors, at least, would be keen to explore. When we started to organize a panel on the subject, we learned that the rules of the AAR (which is, effectively, the agents’ trade association, although it doesn’t act as such in many ways because of its highly independent-minded membership and the potential for restraint-of-trade violations) were interpreted by many to mean that agents could neither set up publishing operations nor charge authors for services. In that ancient time, very few agents would openly discuss the possibility of working with authors in anything but the time-honored way of selling their proposals to publishers on commission. But times have changed. A quick check of recent news and announcements in our office turned up nine agencies with announced digital propositions. These range from Waxman Literary Agency’s Diversion Books, an ebook publisher, to the Ed Victor Agency’s Bedford Square Books publishing arm working through Open Road, to, in most cases, consulting services for the agency’s clients on ebook development and distribution. The other seven on our list right now are The Knight Agency, BookEnds, Dystel & Goderich Literary Management, McDermid Agency, Levine Greenberg, Curtis Brown UK, and Andrea Brown Literary Agency. There are certainly some we’ve missed. And there will undoubtedly be more in the weeks to come. The Knight Agency did a really nice job of laying out the suite of services they’re going to provide through their offering. It’s very impressive, including content editing, line and copyeditor referrals, ISBN number assignment, copyright registration, cover copy, cover design and consultation, file conversions to ePub and mobi, uploading files to major retailers, dynamic pricing, metadata, search engine optimization, marketing plans, subsidiary rights, royalty tracking and payments, oversight of existing contracts and obligations, and, down the road, arranging for print publication through POD or other means. But what really surprised me was that the Knight Agency says they are absorbing all costs except copy-editing and working for 15% of the revenue. The range of services they are offering, even without the copy-editing (which can be anywhere from $500 to $3000 or more, depending on the length and complexity of the manuscript), requires real humans to spend real time doing the work. They seem to be offering to design the cover at their expense, which is a value of anywhere from $200 to $2000. The Knight Agency is undertaking a substantial investment in each book that will be done in this program and, if I’m reading them right, will only get that money back at 15 cents on the revenue dollar before they earn any profit. That’s a commitment! And even though the service is being offered only to existing clients of the agency (at least for now), it’s an impressive one. So with that context, I’d offer a few observations. How everybody is going to feel about these agent service offerings is going to depend a lot on how they’re used. To the extent that they are used as leverage by authors with big backlists to push publishers to higher ebook royalties, the big houses won’t be pleased with them. But if they turn out primarily to be “farm systems”, giving exposure and building awareness for an author who can then “graduate” to a “real” publishing deal, everybody might be all smiles. If that’s what happens, these services become something like the new digital world’s equivalent of an agent getting an author to write a piece for the New York Times Sunday Magazine or to start blogging to build a following: a career-building step that leads to a major house. If that ends up being the prevailing effect, everybody will be smiling. Let’s remember that Amanda Hocking went from self-publishing to a major publisher deal and that Barry Eisler decided that taking Amazon’s offer to publish him was more appealing that truly doing it himself. Perhaps for as long as five or ten years, the print component will remain an important part of any book’s total revenue potential. None of these agents can do much to help there (although a distributor could.) Even if what Knight offers turns out to be high quality across the range of services and what they’re offering to cover out of their pocket versus what they’re planning to take in revenue is sustainable (hard to say from here), they’re still going to want to sell lots of books to publishers. Will this service offering help them or hurt them in that regard? Will publishers see them as developing competition? Or will the commercial proposition of each book on offer remain the key element of each negotiation? We’ve come a long way in the past two years, from a time when many agents thought getting involved with self-publishing was a non-starter to a moment now when, in the words of one agent I spoke to last week, “none of us has any choice” but to provide digital publishing advice or capabilities to their clients. The next two years will probably bring much more change than that. We’re putting together a new Publishers Launch Conferences show called eBooks for Everyone Else for both New York (on September 26) and San Francisco (on November 2). More details will be announced shortly. “Everyone else” is anybody without an IT department, and we always knew agents would be an important part of our audience (along with authors and small- and midsized-publishers) and our program. Looks like that show will be very well timed.